Want to save more with Tyroola? Get up to 50% TYRE CASHBACK when 3 friends buy with your unique promo link... and they can get the same deal on their purchase! That's $370 CASHBACK on a Mazda 3's Bridgestone set or $740 CASHBACK on a Toyota Hilux's BF Goodrich one. It is simple. Help us grow the Tyroola family and save when your friends purchase. 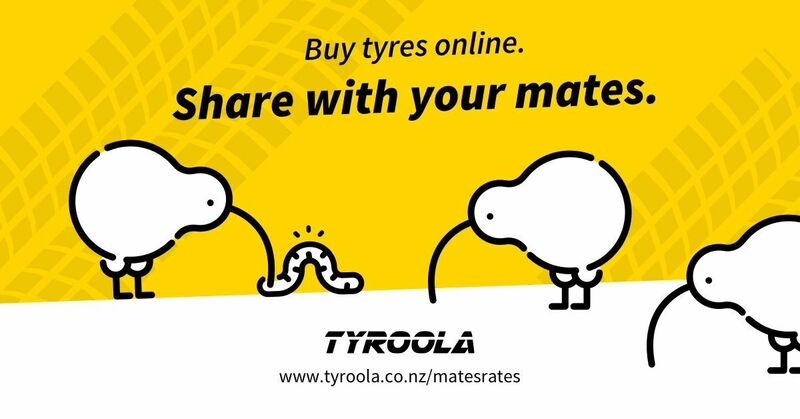 Buy: Choose your preferred tyres and check out to receive your unique Mates Rates link. Share: Share with friends & family who have 30 days to purchase 4 tyres each using your Mates Rates link. Get your tyre refund: Receive a pay back according to the number of your purchasing friends. Tip: Tell your friends they can get the same deal. Sharing your link with more people increases your chance to receive your 50% tyre refund even faster.